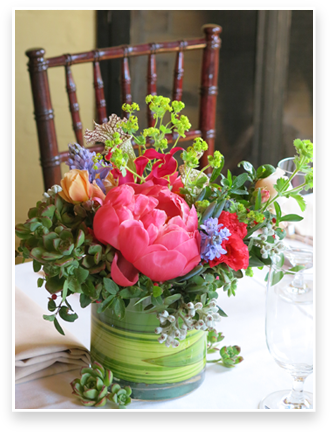 Since 1990, Kathleen (Kate) has provided custom, wedding floral arrangements and design services to couples and their families. Complementing floral wishes for this special day, as related to styling and overall décor, as well as helping the couple include family traditions and observances into the wedding day, is the hallmark of Kate’s work. The central location of the Kate’s Blossoms’ Bay Area design studio, combined with experience designing events in this region, gives Kate and her staff the unique ability to help coordinate the many details of your wedding design and décor, allowing you and your guests to fully enjoy the splendor of the exquisite, Northern California area on your memorable day. An extremely extensive inventory of rental props (arch, Chuppah, display pieces), vases & containers to purchase or to rent with your wedding designs, ribbons and jewels, and pretty much any notion one could imagine including in their wedding styling. Included in our rental collections: Vintage, rustic, country garden, winery influenced, European, contemporary, elegant, classic, and a wee bit of retro. A studio cutting garden where most of our floral designs’ succulents, grasses, and difficult to find heirloom flowers are grown and sourced. Our remodeled, consult studio. It is here we begin our look and our listen to your ideas and dreams, to help you fully style your special day. A walk in cooler filled with the week and weekend’s flowers headed to weddings, special events, and client’s private homes.